Reunion merchandise is still available, so get your souvenir item! Couldn't attend but still want a signed photo? Remember you can get your very own d cast photo or CD - - signed personally to you -from Henry Darrow, Don Collier, Rudy Ramos, or Linda Cristal from Out West Entertainment. Fan Plinio came all the way from Chile - just to see The High Chaparral! Two years of planning, endless emails, months of phone calls to Tucson, dozens of boxes shipped, and finally - Reunion 2011! We traveled over 111,000 miles, spoke many different languages, and in the end, had a ball! 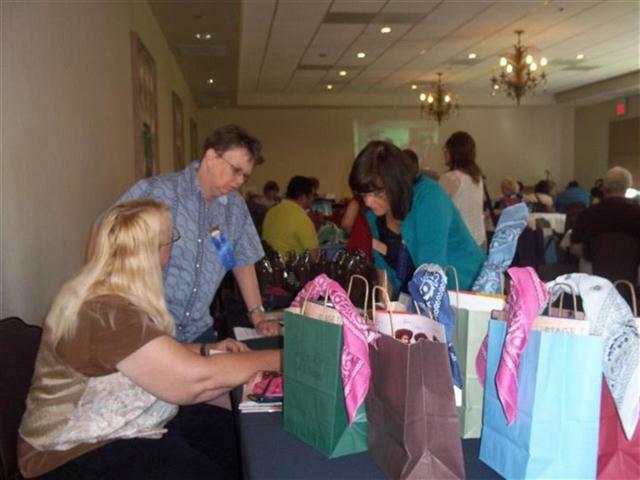 Vickie, Rusty and Penny preparing goody bags and getting ready to check in fans at the welcome table. Presented awards to the celebrities as a gift from the fans. 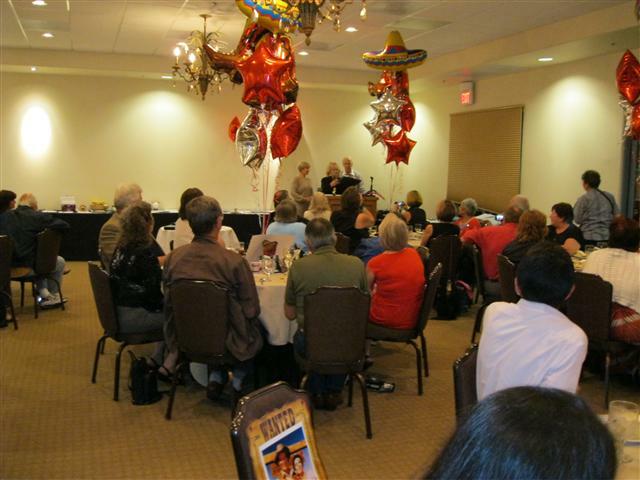 Had a special presentation to Kiva Hoy in memory Bob Hoy by Susan McCray. Celebrated to a Mariachi band, toured Tombstone, and fell in love all over again with the Cannon Ranch. Learned backstage stories from Manolito, Sam Butler, and the people who really ran the ranch (like Kent and Susan McCray, Bob Shelton, and crew, actors, stand-ins, and production folks). Dined on food prepared by one of the top 10 chefs in Tucson. Watched episodes side-by-side with the HC cast and crew. Took horseback rides on the desert trails surrounding Old Tucson. Enjoyed a private performance by a great country music band. Met our heroes, made friends, asked questions, and had lifelong dreams fulfilled! It's so difficult to try and find an absolute favorite memory. We have not had that much fun for 3 solid days in a long, long time. My husband would occasionally watch High Chaparral when it was on in syndication years ago, but after the reunion, he's wanted to watch 2-3 episodes of HC every night. He is hooked and we both can't wait for the next Reunion. We both agree that everything Don Collier said kept us laughing at all times. We never knew what he would say next and it was always funny though we feel he was not trying to be "funny". Most of the things we're still laughing about would probably not be printable. Don is now Gary's hero! I had the chance to get to know new friends. Some I'm still in contact with since returning home. Others I wish I had thought to get their email addresses to send them pictures I took of them. Making new friends has been a lot of fun for me and keeps the fun of the Reunion going on forever. It was wonderful to finally meet you face to face, as over the last year I feel we became friends through email. Probably the most memorable, and definitely one of the favorite memories of mine, was the Sponsor's Dinner tribute to Bob Hoy. It was so moving, so wonderfully well done. I tear up even now remembering Kent's words as he choked up and asked everyone to stand and applaud Bob Hoy. It was such a beautiful part of the weekend. Thank you also for your beautiful and moving speech at the Sponsor's Dinner. Speaking for all of us, and letting the actors know how much we have enjoyed their work, how we thought they were "hot then" and still think they're "hot now", really resonated with me. You spoke so eloquently for us all. Thank you. The words you chose perfectly conveyed what we all feel. Everything was perfect; from the Lodge on the Desert accommodations and staff, the mariachi band, the cocktail reception Friday night to the beautiful way the tables were decorated. I can't neglect praising the outstanding, delicious food all weekend. I'm so glad I "stumbled" upon the HC web site and the 2011 Reunion information back in January. I would not have missed this for the world. Gary is hooked on Arbuckle's coffee. I've already placed 2 large orders for his coffee supply and for some Christmas gifts! I even ordered some of their delicious vanilla decaf tea which I sampled at the Lodge restaurant. We enjoyed getting to know Pat, Denny and Joshua Willis who sat at our table at the Sponsor's dinner. They are such a nice family. We love doing business with companies from the USA! Fans watching the episode 'Ride the Savage Land' with Chaparral cast and crew, including Henry Darrow. What a treat to get to chat with Henry and the rest of the cast as they watch themselves on screen. How could I forget to include another very favorite memory from the Reunion....that was having the chance to watch HC episodes with the cast and crew that made the magic happen. Friday morning while we watched High Chaparral episode, "Mark of the Turtle", Don told a great story about a joke played on him while filming that episode. Saturday night we all watched the High Chaparral episode, "Ride The Savage Land". The next day I had to ask Henry how they filmed the part where Manolito was hanging upside down on a cross. The close up scenes didn't seem like it was a stunt double but it looked like it was actually Henry. I had wondered if they just filmed him right side up and turned the film around in the editing room. Henry's reply was classic, "NO! They hung me upside down! The blood kept rushing to my head and Cam was purposely taking forever to do his part to keep me hanging there longer! It was terrible!" What a fun experience to watch High Chaparral episodes with the actors, production members and crew and then hear about the details. That was one of the best parts of this weekend Reunion. The approachability and availability of the actors and others involved in the High Chaparral series. No pretense, no "entourage", they weren't brought in for a brief Q&A and then escorted out. They really seemed to appreciate the fans and enjoy hanging out with us the whole weekend. I recall reading something Rudy Ramos had said at another High Chaparral Reunion. He said, "It's like we're all on vacation together." and that's exactly how it felt. I was sitting around drinking coffee out of my new Old Tucson Studios mug - new to me, and a new design from the Studio as well - thinking of all the excitement that happened just 2 short weeks ago. Seems like I only got home. Sunday at the reunion started out kind of crazy for me. It was my last chance to get Don, Rudy and Henry to sign all the photos and T-shirts that had been auctioned off on Ebay. Penny and I had planned to take the three of them off somewhere before Sunday to sit down and get this done, but getting them all in one place at the same time, doing the same thing is kind of like herding cats, as the saying goes. It just didn't seem right to take them away from the fans they were having so much fun with. So it was up to me to corral them individually and get the needed signatures. Its not so simple as it sounds. Think they just sign something without thinking? They wanted to know something about each person they were signing for, so they could make it personal. And besides the Ebay winners there were special folks at the Lodge on the Desert we just had to give something to. The banquet captain, Carlos, who took such great care of everything got a cast photo signed by all three guys and he was so thrilled he kissed me! One of our severs accompanied me back to our meeting room so she could get autographs as well, which the guys were happy to do. And we also gave a signed cast photo to the resort's chef (well, to his parents actually, as they were big fans). The chef stopped by personally for the Saturday night dinner to make sure everything was just right. He is an award-winner for his chef skills and the food certainly reflected that. Once I had all my promises taken care of I could relax. Sunday was the day that was all about the fans who had become, in just a few days, part of the Chaparral family. Time for the last photos to be taken, to get the auction winnings signed, and build a few last memories. Speaking of the auction, I really think its the highlight of the reunion, after the day at Old Tucson. Those who won were like kids at Christmas, giddy and smiling and practically jumping up and down. I think everyone got at least one thing they bid on, there were so many wonderful items. Three tables chock full of High Chaparral goodness. However will that be topped for the next reunion? Nieves, who came with her sister all the way from Ireland, made a big impression on me with how thrilled she was to get a stack of precious old newsletters from the Mark Slade Fan Club. "I'd Rather Be Watching High Chaparral" license-plate holder was another big hit. Don's CDs of the radio drama West of the Story was particularly popular, especially since his co-star, Billy Joe Patton, was Don's guest at Old Tucson and was a big hit in his great cowboy duds. Don was sending more than a few fans my way who didn't win to get their own copies of the CDs. After the auction hoopla, Don and Rudy sat themselves down at two of the big round tables in our meeting room. Perfect for pulling up a chair next to them for a chat. And in some cases (no names mentioned) actually forgoing the extra chair and sitting right on a famous knee! They listened, they shared, as if they had all the time in the world. Don had a stack of 8x10s of his handsome face to sign and give to his new pals. Rudy had five or six different photos that he was signing and giving away for anyone who wanted one. And of course everyone had to have their photo taken one last time with them both. It was a perfect end to a perfect weekend. But it wasn't really the end. I had to hit the road - I-10 to be exact, for my six hour drive back to the Palm Springs, CA area. But there were some fun activities for those whose flights didn't leave until Monday. Like a tour of Tucson. A concert. And lots more visiting. But someone else will have to fill you on that. By the way, Plinio has a great little video that he took inside the San Xavier Mission, one of the most beautiful churches I've ever seen. The front of the mission was used as the home of the Montoya family. And Carlos just posted many wonderful photos of the inside of the church as well. Its better than postcards! Yes, its on Facebook. I also just watched a video from Plinio of Kent telling Gabriela and Fidel a funny story of the doctor who took care of the cast and crew on the set at Old Tucson, with Gabriela translating into Spanish as he tells it. THANK YOU to all the generous folks who've shared their photos from the Reunion! Thanks to you everyone can share in the great times and memories! Send along your pictures to share by emailing us and we'll include them in the Gallery. Do you have a special memory or story to share? We want to hear it too and will feature it in an upcoming newsletter, so contact us at info@highchaparralnewsletter.com. 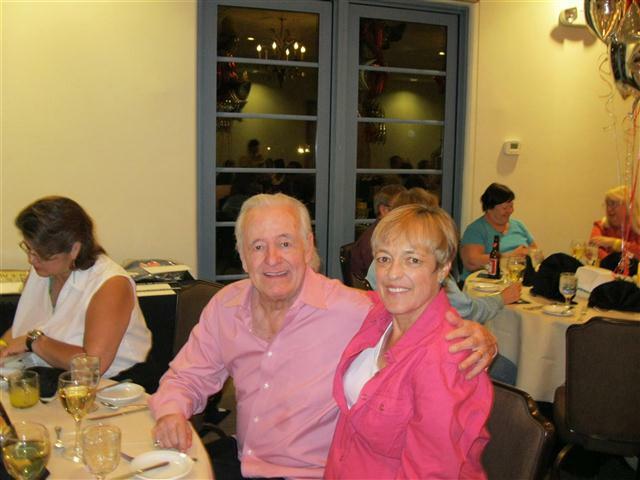 See the Reunion Gallery of fan photos online to share in the fun. And remember we're on Facebook, so join the conversation there for lots more photos, memories and to meet other fans. 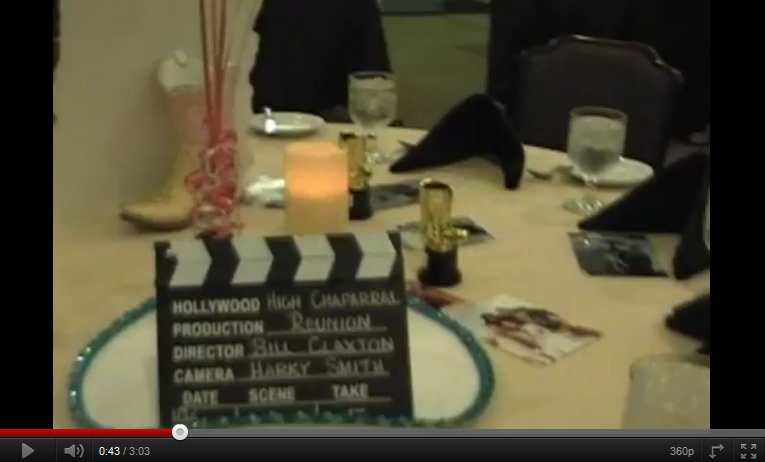 Good evening and welcome to The High Chaparral Reunion Sponsor’s Dinner! Those gorgeous balloons were designed and provided by our own Susan McCray – so to Susan, thank you for providing the perfect crowing touch and for making tonight special for all of us. Kent - you may be Big Daddy, but when it comes to parties, Susan is Head Honcho. Fans of High Chaparral know that John Cannon had a dream when he went to Arizona – that all kinds of different people could learn to live together in peace, despite their differences and no matter where they came from. 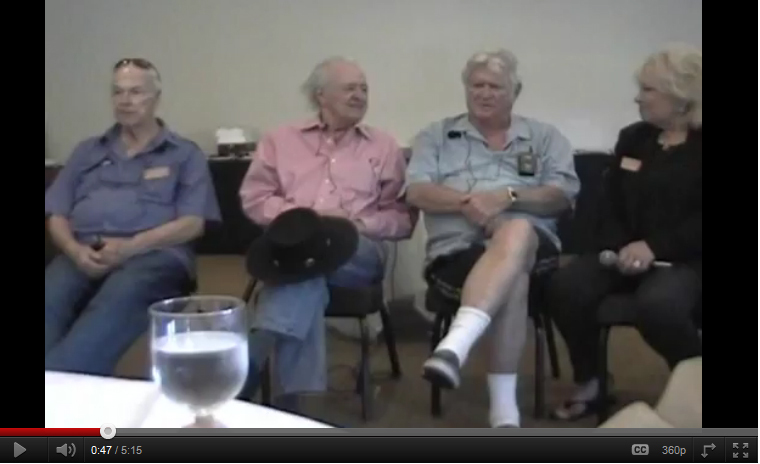 I think because of that idea, fans of High Chaparral are special and represent a fulfillment of that ideal. This weekend we have different people, from all over the world, who speak different languages and come from different cultures, gathered here to celebrate The High Chaparral. This is the Sponsor’s dinner and tonight you are sitting with the Reunion Sponsors – and of all the extremely special High Chaparral fans, this group stands out. To our sponsors – thank you for being so joyfully open with your hearts and (something that is close to MY heart) warmly open with your checkbooks. Many of our Sponsors are here, but there are so many who sponsor who can’t attend the Reunion. They send money anyway. I want to be sure that all the Chaparral cast and crew understands something I think is important: All these Sponsors – the ones sitting here tonight and the ones who are at home anxiously waiting for Facebook photos and stories to be posted– give so generously. They give because they love the show, they love what you created, and they love you. They give because they wanted to bring The High Chaparral home to Tucson. To all our sponsors– thank you. Without you there simply would not be a Reunion. Now - to our well-loved Guests of Honor –thank you for coming home to the ranch, and for spending your weekend here with us. 40 some years ago we all sat far too close to the television on Sunday nights to watch you. We thought you were the bravest, most handsome and hottest cowboys we’d ever seen. We thought you were amazing and fascinating. And we still do. The High Chaparral is a cultural icon – not only here in the U.S. but all over the world. I want to tell you about a tiny little community in Malaysia of about 300 people. It’s a traditional Malay Indian village, they raise some cows and basically live off the land which is quite beautiful. The families who live there were deeded their land about 150 years ago, but in 2007 the title was taken in a property scam by some large developers. This almost certainly illegal land grab threatened the 65 or so Malay families, and ignited protests as the villagers fought in court and refused to leave their home. There are well over 100,000 internet pages when you do a Google search about their fight. Do you know what that little Malaysian village of 300 people nicknamed their village? And what is mentioned in those 100,000 internet pages? The High Chaparral. They named it The High Chaparral. They chose it because they raise cattle, they know the show and love it. You created a cultural icon that people the world over love and remember. Your loving fans believe you deserve an award for your work and talent, and so tonight we’re giving you one. It doesn’t have an academy, university or studio behind it, but it has the love and respect of your fans. 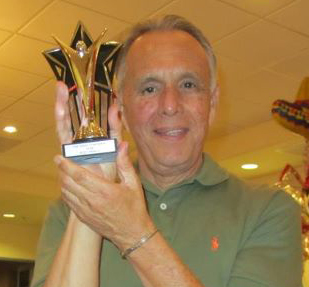 Please accept this award in recognition of your accomplishments, talent, creativity and artistry. Thank you for your work and for making the finest television western ever created. Now if you turn your attention to your table, you see there are small cowboy boot trophies. Notice that although this is a boot and golden, I didn’t call it a golden boot. That’s because the very last golden boot award was presented to Bob Hoy in his hospital room shortly before he left us. It was the last Golden Boot that will ever be presented. 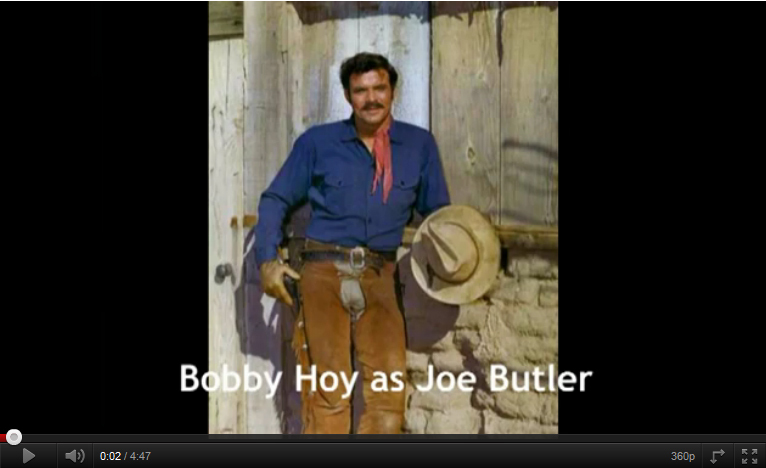 Few people know the great debt The High Chaparral Reunion owes Bobby Hoy. 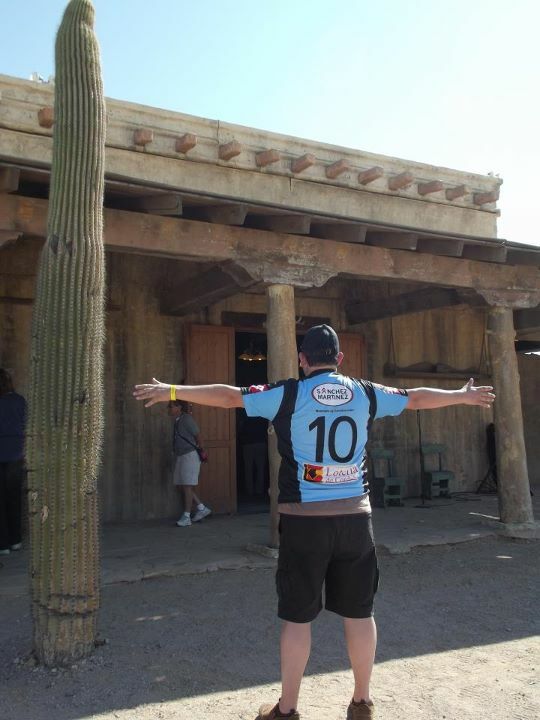 Back in 2003 a small group of around 12 fans decided it would be fun to meet up in Tucson. One of them mentioned it to Bob, and it was Bobby who said if they met in Los Angeles at the Sportsmen’s Lodge he could get other cast members and production crew to attend. And then he got on the phone and started calling, getting addresses for invitations, and told folks they needed to come. I knew Bobby, and I can imagine very few people turned him down when he called. It’s been 8 years since that first Reunion – they had 12 fans and 8 celebrity guest and a few others…no one kept records because it was all so unexpected, exciting and surprising. This year is our 5th Reunion, and tomorrow at the Ranch there will be hundreds of people. TV cameras, newspapers, magazine reporters. The Reunion is now a non-profit corporation because it’s grown so much. All because Bobby thought he could probably get a few people to come to lunch. 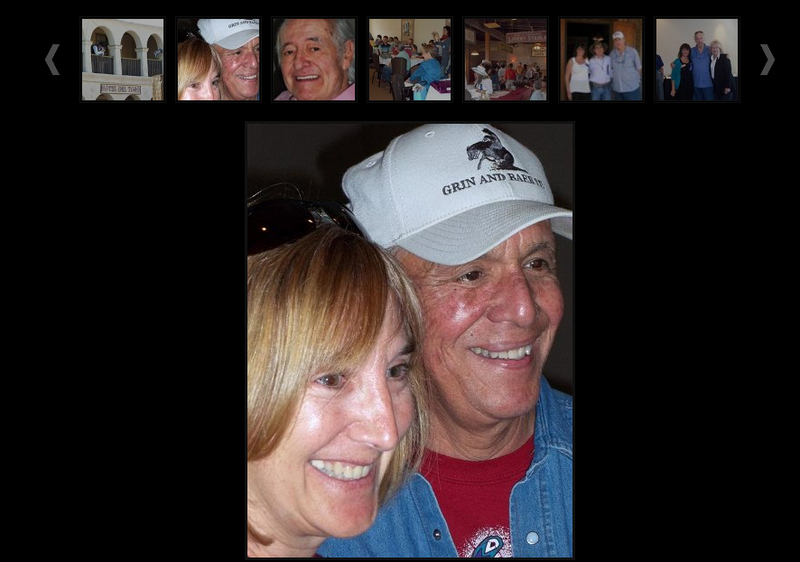 Over the years Bob continued to be a very active advocate for the Reunion and for High Chaparral fans in general. I think it’s fair to say these Reunions as they exist today would look much different if Bob hadn’t been involved. So in addition to thanking our wonderful sponsors, and all of our handsome, dashing and brave cast and crew, The High Chaparral Reunion is very proud to thank Bobby Hoy. 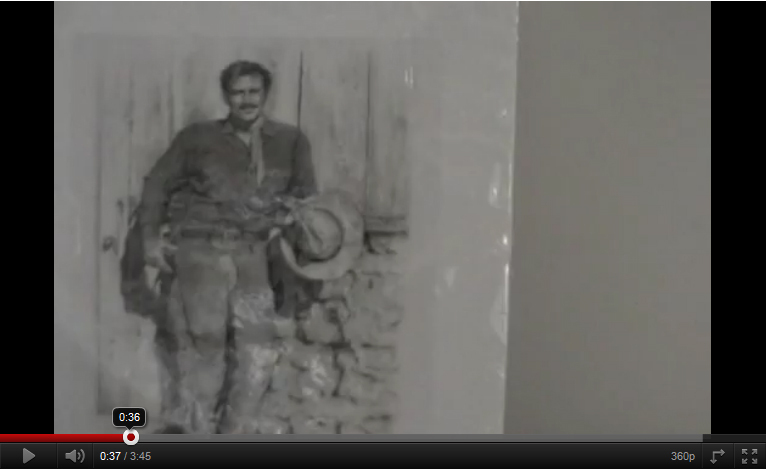 Private first class Robert F. Hoy loved the Marine Corps and all it stood for- he was the quintessential proud Marine. When i interviewed Bob, I asked him to share what being a Marine meant to him? Kiva, I would like to present this certificate to you as a special tribute to Bob, from Kent and I - for his courage, his honor, and his commitment to everything he did in life. 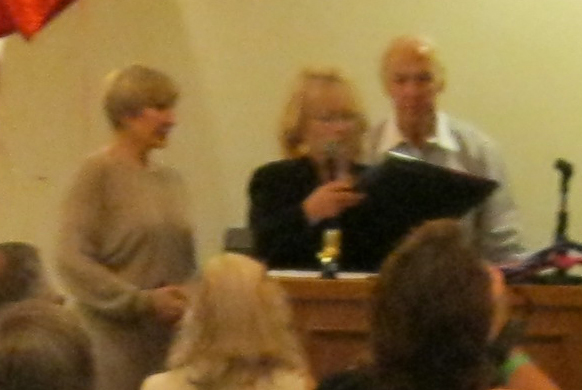 Susan McCray with husband Kent presents a certificate to Kiva Hoy in memory of her husband, Bob Hoy. Bob Hoy’s name is engraved on a brick lining the winding pathways to the rally points in Semper Fidelis Memorial Park. The rally points will be places to reflect upon the sacrifices past and present Marines make to protect our Nation. The Park overlooks the National Museum of the Marine Corps in Quantico, VA. WARNING! 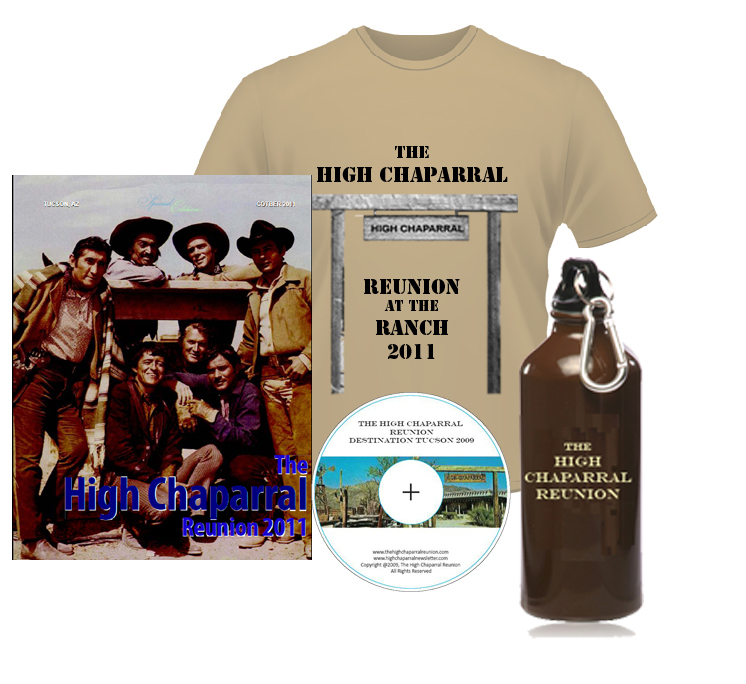 Do not wear a High Chaparral Reunion t-shirt to a convention if you wish to be left alone! Although I was unable to go to Tucson, I attended Supernova this month; the annual, sci-fi/fantasy convention. As usual, Jesse went in costume and Kristian, his older, ultra conservative Web Developer brother wore dress pants and a work shirt. (When I asked him why he didn’t dress up, he smiled and said, ‘I did, I came as a Web Developer.’). I wore my Reunion t-shirt and shorts. It all started with a few sideways glances. Given that I’m no Dolly Parton, it didn’t take me long to realize people were looking at my t-shirt. I thought they were meant to be smart but this Jedi looked confused. ‘So why are you wearing it to a sci-fi convention?’ he asked. Towering over most of the crowd, Harry Potter’s Hagrid made his way toward me. His beard was enormous. ‘2011 Reunion? Here?’ he asked, pointing toward my t-shirt. I told him about the newsletter and forum, recommending he visit Google for more information. After Hagrid left I returned to browsing through Star Trek memorabilia. ‘Oh I love that show!’ said a pencil thin, well I wasn’t quite sure what it was but it sure creeped me out when it jumped in front of me. The man had half a normal face and the other half looked like oozing yuk. Rubber innards dangled out of clothes that appeared to have been dragged from a grave. I later learned he was a zombie from the 28 Days/Weeks movies. ‘Don Sebastian,’ called an elegant brunette from nearby. She swept toward us in her medieval dress. It was Arwen from Lord of the Rings. Arwen and the zombie questioned me about the reunion. Half wishing I’d printed up information sheets I repeated details about the forum and newsletter. Nearby Kristian, who nobody identified as a Web Developer despite his brilliant costume, leaned against a pillar, grinning. ‘I bet you’re glad you wore that today,’ he said. The interruptions continued. Everyone wanted to know about High Chaparral. A storm trooper, a Halo soldier, Tim Burton’s Mad Hatter and Gandalf the Wizard all questioned me. Evidently HC is popular in many worlds throughout the universe. We managed close to an hour without interruption and I was lulled into a false sense of security about no longer having to discuss newsletters or forums. As I dug through my purse looking for the list of Halo books Jesse already had, with a view to buying him more for Christmas, someone tapped my shoulder. It was Batman’s Poison Ivy. For a split second I felt like saying, ‘No, it’s where racing fans go to visit the stallion,’ but thought that might open a whole new can of worms. Besides, I remembered Penny once describing HC fans as, ‘a wonderful, friendly bunch’. Drat. I had to be wonderful and friendly. I smiled, nodded and repeated my speech about newsletters and forums. No one interrupted me for a while, presumably because I walked with my arms crossed to hide my t-shirt. That lasted until I changed position. ‘Excuse me.’ A teenage Vulcan pointed to my t-shirt. I gave her my wonderful and friendly smile. ‘A classic western,’ I said, feeling like the parrot that’s always being asked if she wanted a cracker. I glanced anxiously at a man who had just picked up a little figure of the Ghostbusters Marshmallow Man. I hoped he’d put it down so I could buy it. That called for a sarcastic remark but I was too busy hoping the man would put the Ghostbusters figure down. ‘Sort of depends on your idea of old,’ I said, trying to move away. She considered the remark and I watched, disappointed, as the couple bought the figure. Years ago, I bought myself a little Pillsbury Dough Boy. I have always loved him. I even planned to buy his little sister. When a very sweet, very ill lady asked for it how could I refuse? Dough Boys are like hen’s teeth Down Under so I’ve never been able to replace it. I thought the Ghostbuster’s figure would make a close second. ‘No, I meant -’ I stopped, realizing the Jedi wasn’t the dimmest visitor after all. ‘So what was it about?’ she asked. ‘So, will you be High Chaparral’s rep again next year?’ he asked.